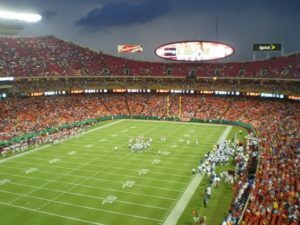 One game shy of reaching the Super Bowl, the Kansas City Chiefs announced plans to upgrade Arrowhead Stadium during the off-season as it seeks to enhance the experience for fans. The stadium has served as the Chiefs’ home for more than 40 years and has some of the rabid fans in not just the NFL but all of sports. Witness the attendance at the AFC Championship against the New England Patriots played on a Sunday night when temperatures were biting cold but not as bad as minus temperatures predicted earlier. The iconic Arrowvision scoreboard, which hangs over the west end zone and is shaped like a football, will be modernized. The structure will maintain its size and shape but will be fitted with new LED panels to provide a more enhanced picture for spectators. Other enhancements include waterproofing measures for the stadium’s upper deck to be reapplied to protect the enclosed space below the club level, a move designed to help Arrowhead Stadium’s to deal with adverse weather conditions. All seats in the upper deck are removed for the process, and will be replaced by new seats featuring cupholders.